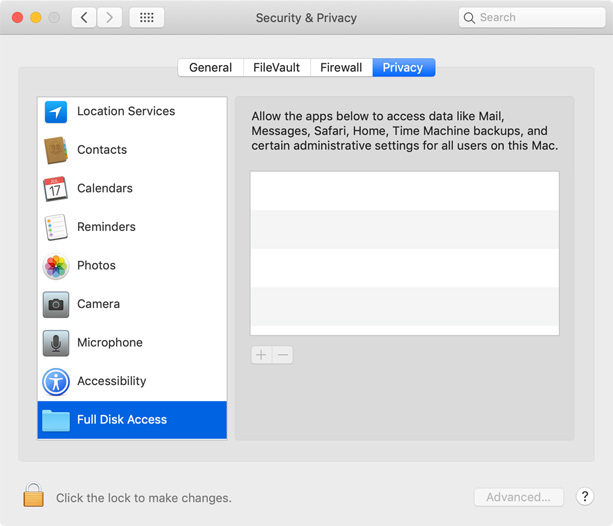 Apple's macOS Mojave introduces stricter privacy safeguards that, by default, make it more difficult for third-party apps to access certain types of private data (e.g. Mail, Photos, Safari, Messages, etc.). When a third-party app attempts to access some types of data (e.g. Calendars, Contacts, etc. ), macOS will ask you if it should allow the app to access the data. In those instances, you can simply click "OK" and macOS will forevermore allow the app to access that data without ever prompting you again. However, there are other types of data that macOS will never ask if it should allow the app to access the data. Instead, it will simply deny access to the app. 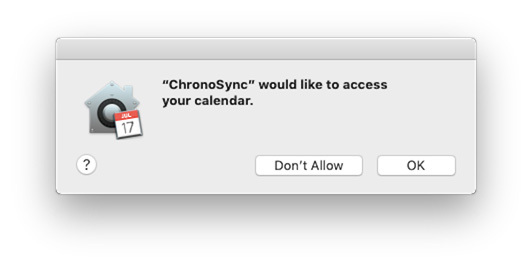 Obviously, this presents a huge problem for ChronoSync, since it needs access to all of your data, in order to back it up. Fortunately, there is a way to grant ChronoSync access to all of your data, and it's called Full Disk Access. Unfortunately, Apple has intentionally designed the process of granting Full Disk Access to be difficult, so that users are discouraged from granting Full Disk Access unless absolutely necessary. While it can be argued that most apps don’t need full access to your data, in the case of backup utilities, it is absolutely necessary that they have full access. Exit ChronoSync, if it is currently running. 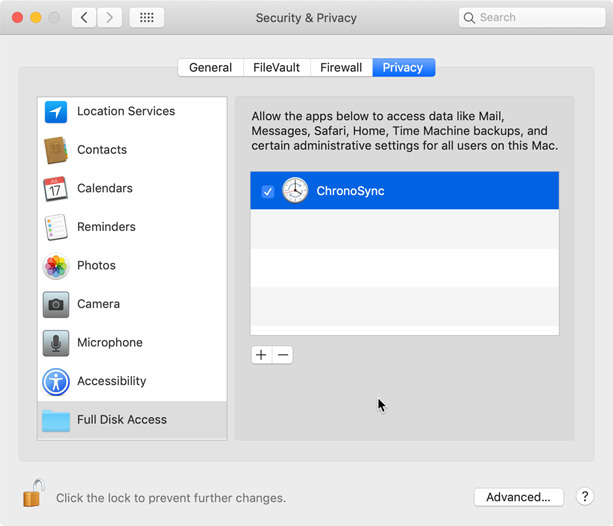 Open the Security & Privacy Preference Pane in the System Preferences application. Click on Full Disk Access in the categories list. Click the padlock in the lower-left corner to allow changes. When prompted, enter your credentials (username and password) for your admin user account. Click the + button to add an application. Navigate to where you installed ChronoSync (e.g. /Applications).